February is the NJ Romance Writer's Jersey Romance Writing Month or JeRoWriMo (or Jerry Rhino, which is the mascot and often what the month is called when someone messes up the pronunciation). It's a bit like NaNoWriMo only the challenge goal is to write 30,000 words in the month of February. The sense of community is lovely, especially since writing is such a solitary occupation. Most of the time it's just you and your laptop and the people in your head, but this month, everyone cheers each other on in their progress, no matter how small. In fact, the biggest rule is never to use the word "only" - as in "I only wrote this many words today." For me, JeRoWriMo - the challenge and the community of it - provides some motivation. Whenever someone sets me a challenge, I'm going to do everything I can to meet or exceed it. That's my competitive side kicking in. I'm going to use that impulse this month to get my current manuscript finished and ready to submit. My progress so far has been steady, if a bit less than I wanted a couple of days, and I believe I'm going to make my goal this month. I've participated in the challenge twice before. Parts of The Prince's Consort and The Artist's Masquerade were written during two separate JeRoWriMo challenges. I guess the challenge worked out to be lucky for me too, since they're my first two published books! I'll keep you posted on my progress, and for everyone participating in JeRoWriMo this year, good luck and keep writing! Before I leave you, a couple of promo-type things: Dreamspinner is having a 25% off sale this weekend, and the Chronicles of Tournai books are included along with lots of other great books. Check it out if you need weekend reading. If you haven't seen it, I visited Between the Covers for Romance A-Z this week, and there's a chance to win an ebook of The Artist's Masquerade. There's a new author visiting every day this month, so take a look while you're there. 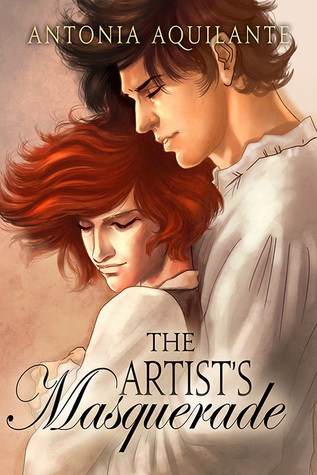 You can also still enter the Goodreads giveaway for a signed copy of The Artist's Masquerade.